This post is part two (of three) in a discussion about American legacies: the legacies of the Founding Fathers, the legacy of the Civil War, and the legacy that the current president is forging. Part one covered American legacies from its founding till the Civil War. This post is about the legacies of Americans after the end of the Civil War till the Civil Rights Movement. As was the case with the previous post, despite being long winded, it’s still a reductionist approach to major historical events. Although several simultaneous developments and movements may have contributed to some of the trends discussed, I didn’t dive into any of them as that would be well beyond the narrow scope of our discussion. Do you really think that central philosophy of the Democratic Party has actually changed over time? And in case you forgot, even the KKK and Jim Crow laws originate from the Democratic Party, which has always been the party of racism. This brings us to the Reconstruction era, the introduction of Jim Crow Laws and everything else. I will try to keep this section short, and point to data from post-Civil War right up to 1928, When FDR was first elected. My reasoning is simple; in this era the Democratic Party solidified their control of the Southern States, as seen in figure 1 below, showing the election results from 1896-1928. I skipped over the results from 1856-1892 as they are very similar. Figure 1: Election results from 1896 to 1928. Click here for the map source and colormap legend. By Walk Like an Egyptian used under the CC-BY-SA 4.0 license. 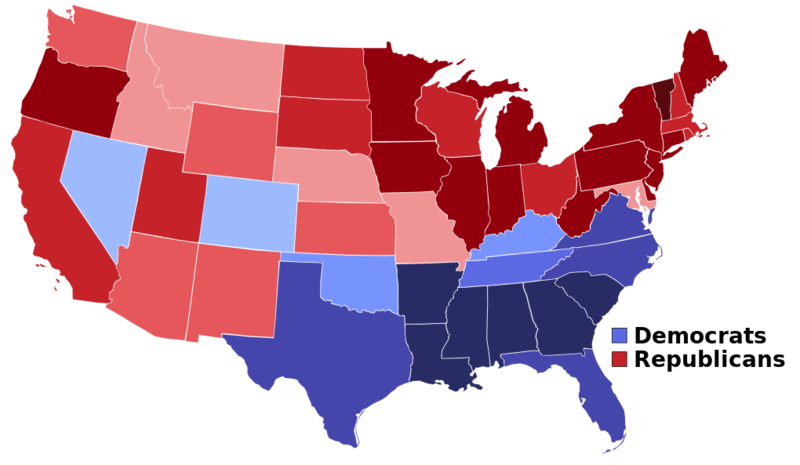 Based on the section on the cause of the Civil War, as well as voting pattern until 1928, its safe to say whatever platform the Democratic Party was selling, the Southern states more or less were in lockstep with it. It’s important to understand that when folks vote for a party or a leader, its usually a multifaceted decision. In the previous section, I glossed over all the other reasons people in different regions or states may have voted for a party or a particular president before the Civil War as the CSA founding documents narrowed the motivation down to a one-issue reason as I cited above. However, to continue focusing on the issue at hand —that is, the legacy of Americans via the lens of racism— I will continue to gloss over most of these reasons, which include different people’s stances on war, industrialization, women’s suffrage, international trade… the list is endless… until the entire nation gets embroiled in the issue at hand (namely, the Great Depression and World War II). Figure 2: Screen shot from this amazing compilation and visualization of lynchings from 1882 to 1964. See 1 for more details about this data. There are several things to note here. The most obvious being most of extrajudicial killings are concentrated in the south, particularly in the Deep South. It is safe to assume, as you allude to, given the stark contrasts between the voting pattern in the North and the South, the people responsible for the racist laws and murders most likely voted Democrat. Secondly, there are quite a few extrajudicial killings in the Northern states as well. Needless to say, racism exists everywhere. And on that note, we can also see that in the West the killings are directed mostly towards Asians and Latinos. Figure 3: This snapshot of size of lynchings (circle diameter) versus time is from the same site, Monroe Work Today, as figure 2 2. 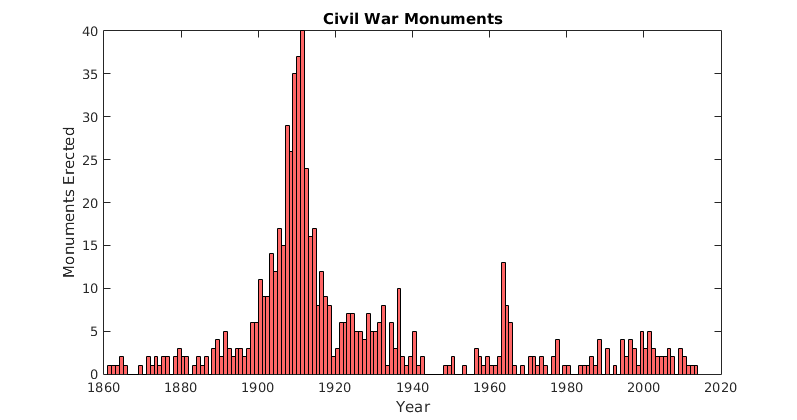 Figure 4: Plotting only the Civil War monuments versus time from the data compiled by the SPLC. I’d suggest deep diving into the CSV for anyone interested as most often they have links to sites indexing individual monuments and the text inscribed on them. Compared to baseline, there are really two peaks worth highlighting: The peak spanning 1900-1920, and then the peak in the early 1960’s. The first peak during the Jim Crow era coincided with the rise of disenfranchisement laws, the rise of the second Ku Klux Klan, and the formation of the NAACP. The second peak coincided with the Civil Rights Movement. Even without looking at the dedications of each individual monument, just based on the trend it seems that these monuments start appearing en masse when movements by Black Americans demanding equality start gaining steam: whether it was voting rights in the early 20th century or equal treatment in general in the later 20th century. If what the proponents of these monuments say—that these monuments were erected to remember the South’s antebellum past, we wouldn’t see such sharp upswings when the suffering minority group demanded their Rights. Instead, we’d see a fairly uniform distribution of when these monuments were established. But the above trend suggests otherwise. There are at least two distinct peaks, which correlate too nicely with movements of equality and justice from Black Americans. It’s safe to say that it’s most likely these monuments started getting erected to intimidate and remind Black Americans who controls their lives, and peaked when the minority’s movements for equality gained steam. Confederate Monument, DeKalb County. This one you’ll have to click through. It’s pretty fascinating. Firstly, the official site took down the original page about this monument. I had to look it up via the Wayback machine. This is already problematic as one shouldn’t hide or destroy history, as mentioned above. But more importantly, you can see that by 1913, when this monument was erected, the erectors are trying to morph their legacy. By now they are already insisting that the soldiers died ‘to perpetuate forever the sovereignty of the States’, which as I pointed above was rather explicitly to only maintain slavery. As mentioned, these were the first five randomly clicked monuments off that CSV file. None of them are interested in the mythic antebellum South 3. All of them —rather remarkably— explicitly have the CSA and the years of its existence engraved. Even if one assumes the most benign and pure intentions of the folks who erected these monuments, it is clear that the monuments were erected in support of a rebellion against the United States, and in support of a would-be country that insisted upon enslaving a large proportion of Americans. So they are both unethical, and unAmerican. Furthermore, if upon showing this evidence, a proponent of these statues stills insists that the monuments are about Southern heritage and legacy, it would mean one of two things: either they are willfully ignoring evidence on the monuments themselves that clearly suggests that these monuments were erected to promote the CSA and what it stood for (i.e. the perpetual racism it promised) or the monuments do in fact symbolically represent the antebellum South’s heritage and legacy. But based on what these monuments memorialize that heritage and legacy seems to be the failed goal of preserving and perpetuating an unjust society ‘to exist in all future time’. Either way there is no justification to erect these monuments. The first interpretation is unethical and unAmerican, and the latter just leads back to the former. As I’ve shown so far, based on when they were placed, as well as what they say, it is quite clear these monuments were primarily placed to intimidate and oppress American minorities as they fought for their equality and representation. Some Americans are asking why should these monuments be removed? The better question is why have they been allowed to stay standing so long. As you mentioned, most of these racist, oppressive actions took place in regions under the Democratic Party rule. As I have shown above, most of these racist, oppressive actions took place in the Southern states under the Democratic Party rule. You further pose whether the “central philosophy of the Democratic Party has actually changed over time?” Well, let’s see if it did. A funny thing happened starting in 1932. Everyone started voting Democrat. This next map spans from 1932-1964, so nine elections. 7/9 were won by Democrats, and based on the sea of blue, the entire country seems to have been regularly voting for them. Figure 5: Election results from 1932 to 1964. Click here for the map source and colormap legend. By Walk Like an Egyptian used under the CC-BY-SA 4.0 license. Figure 6: Education segregation prior to Brown vs Board in 1954. Click here for the map source and colormap legend. By Tony used under the CC-BY-SA 4.0 license. This is the map of where segregation was required prior to Brown vs Board of Education in 1954. This was 22 years after the Democrats won the election of 1932 by a landslide. Despite the spread of the Democratic platform to the entire country, these particular racist laws were only present in the former Confederate states, the Border states, and Oklahoma (which wasn’t a state during the Civil War). 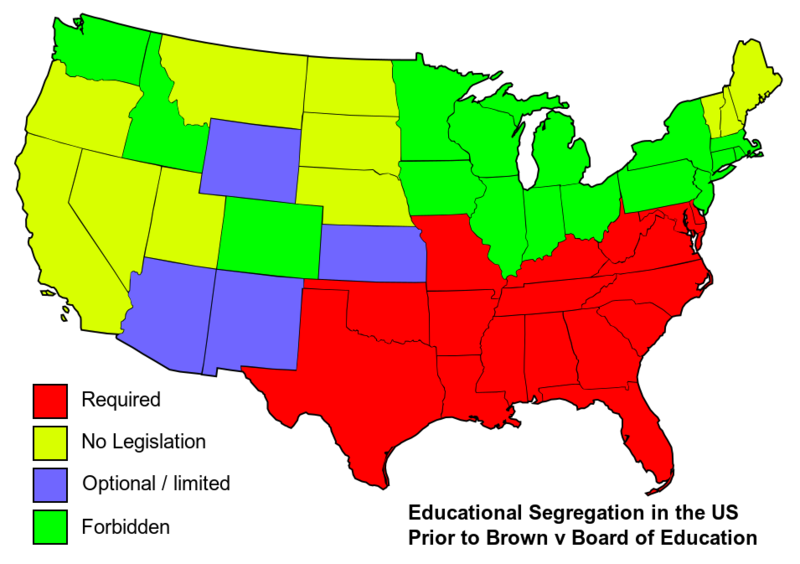 Figure 7: Anti-miscegenation laws prior to Loving vs Virginia in 1967. Click here for the map source and colormap legend. By Certes used under the CC-BY-SA 3.0 license. This map, and the accompanying Wikpedia entry on anti-miscegenation laws gives us even more insight into this time period. 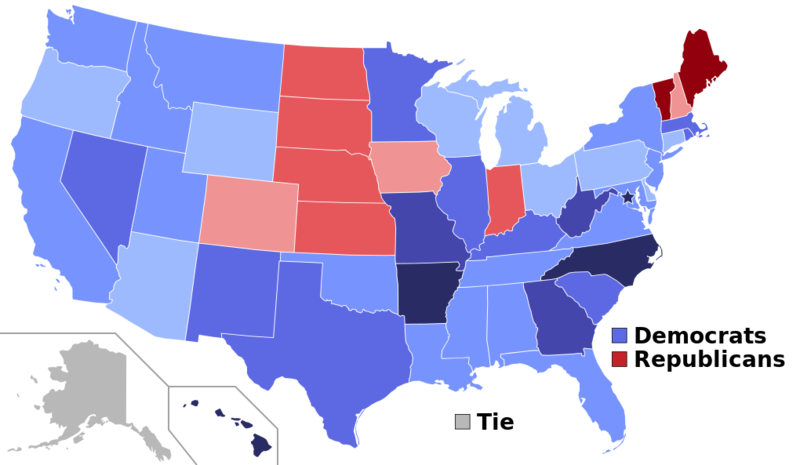 Between 1932 and 1964, 11 states repealed their racist laws. These states voted for both Democrats and Republicans in the time period. 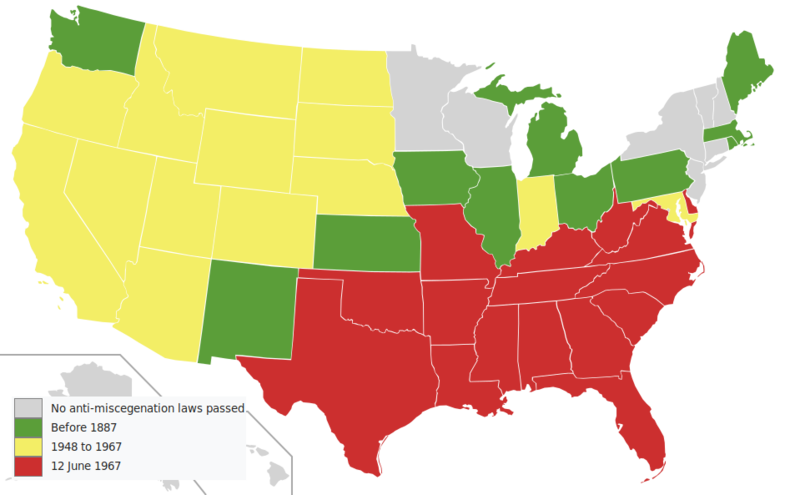 Despite the spread of the Democratic Party to the former Union states, none of these states enacted new anti-miscegenation laws during this time period. Unfortunately, as the theme continues, of the states that didn’t repeal their anti-miscegenation laws, all were either former Confederate states or Border states. These states were forced to repeal their laws after Loving vs Virginia in 1967. Figure 8: Screen shot from the Monroe Work Today’s visualization of lynchings from 1932 to 1964. The theme continues. The killings almost exclusively continued to occur in the South. 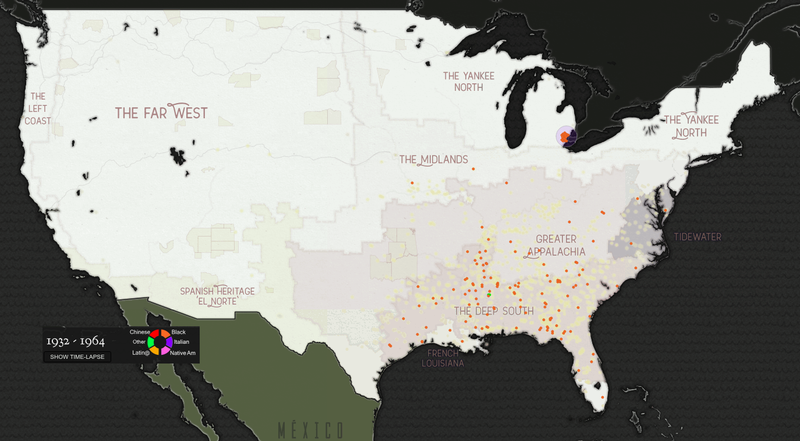 The only cluster in the North is the 1943 Detroit Race Riot. You can read about that incident on your own time. Just based on these few examples, its safe to say a trend emerges. The Democratic Party expanded to almost all parts of the country, yet the naked racism that was correlated with them didn’t spread at all. On the other hand, the racism and violence found in the South remained there, until struck down by the Supreme Court in the examples above or by other actions of the federal government. So what happened to the Democratic Party? To be a fair bit reductionist for the sake of brevity, the Great Depression happened, followed by World War II. FDR —a Democrat— came to power with the New Deal to take the US out of the Great Depression. He and his successors (including the pro-New Deal Republican Eisenhower) “forged a coalition that included the Democratic state party organizations, city machines, labor unions, blue collar workers, minorities (racial, ethnic, and religious), farmers, white Southerners, people on relief, and intellectuals” (straight out of Wikepedia as I couldn’t have summarized it any better). As I’ve repeatedly mentioned, folks vote for a platform that appeals to them. During the depression, the platform offered by FDR and the Democratic Party was inclusive to everyone from the Southern farmer to the Northern Union worker. The New Deal Coalition lasted until 1968. After the Civil Rights Act in 1964 and the Voting Rights Act in 1965 —both passed by the Democrat Lyndon B. Johnson— a Democrat has won the South just once, in 1976. So either the entirety of the Southern states realized that the Democratic Party was racist after the passing of the Civil Rights Act and the Voting Rights Act and switched to the other party within three years after their passing into law, or as I’ve shown in both part one and here, people continued to vote for the party that reflects their beliefs and needs, as they had for the past two centuries. Even viewed through the myopic lens as above, it’s hard to argue that the Democrats were just the party of racists after 1932. This doesn’t mean that after 1932 the Democratic Party didn’t have any racists. That is an absurd claim. I’m sure there were (and are) plenty of racists abound, but since then its best to characterize the Democratic Party as a coalition of people with multiple different ideologies. The same is somewhat true for the current Republican Party as well: there are at least two ideologically different groups who form the Republican base. Furthermore, I will assert —the counter-evidence is left as an exercise to the reader— that more voters with regressive beliefs (including classism, racism, sexism, xenophobia, homophobia) have tended to vote Republican in the past few decades 4. So to answer your rhetorical question, the Democrats were indeed the “party of racism”. Now that mantle seems to have passed on to the Republicans.